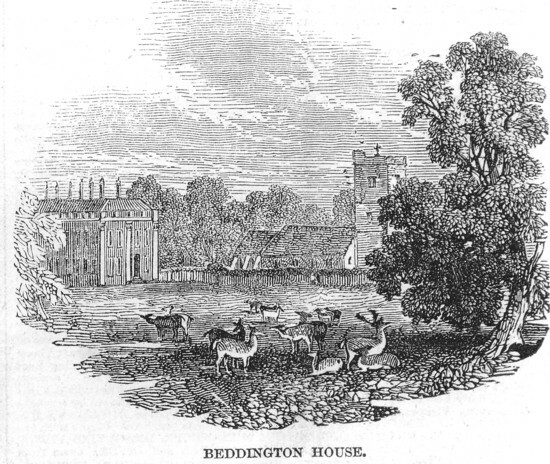 At an easy distance from the town of Croydon, ten miles south-east of the metropolis, lie the picturesque park, and substantial mansion known as Beddington House, the long-continued residence of the ancient family of the Carews (originally from Devonshire), and now the seat of Capt. Charles Hallowell, R.N., who, having succeeded to the property, took the name and arms of Carew, by Royal license, In 1835. Of the original mansion erected by Sir Francis Carew, and in which he had twice the honour to receive the visits of Queen Elizabeth, not a vestige remains, except the Great Hall. The present house was built about the year 1709; at which time Beddington was in the possession of Sir Nicholas Carew, who was created a Baronet by Queen Anne. It is a brick edifice, with stone dressings, and consists of a centre and two deep wings; with the Great Hall for a nucleus. This fine specimen of the domestic architecture of the age of Elizabeth is entered by a handsome stone portal; and is surmounted by an Italian decorated turret. It has an oaken open roof, in the manner of our college halls the principal ribs spring from large carved and gilt brackets, and form an equilateral pointed arch, which, being underset with smaller ribs, assumes the trefoil character: over each arch is a strong beam, forming a brace with the rafters. The flooring is paved with lozenge-shaped slabs of black and white marble; and the walls are wainscoted with oak, in panels. The walls are decorated with carved arms and trophies; and the piers are hung with portraits. The old fire-place has, however, been filled in, and and-irons substituted. On the great entrance-door is an Elizabethan lock, wrought of iron, and covered with elaborate Gothic tracery richly gilt; the key-hole is concealed by a shield of the Royal Arms, which moves in a groove, and slides down on touching a knob in the form of a monk's head. The lower story of the south wing contains the dining and drawing rooms, and other large apartments, (most of which were repaired and modernised in 1817); together with a long gallery that extends through its entire length. Queen Elizabeth's oak, and her favourite walk, were long pointed out here. The fine old place, too, long enjoyed great note in horticultural history; for, here the first orange-trees were raised in England, and flourished for about a century and a half. In short, Beddington, with its olden celebrity, is a place of great attraction for strollers from the metropolis.